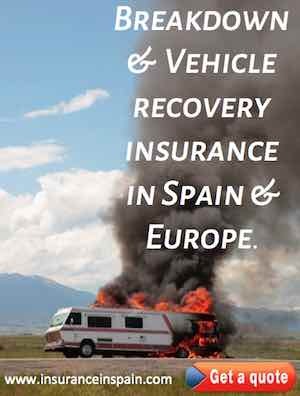 Breakdown recovery Insurance in Spain for any vehicle including cover throughout Europe. Call 965275727 Now. Insurance if your vehicle breaks down in Spain. Breakdowns do happen, even in Spain, and sods law applies and the chances are that it will happen to you when and where you least expect it to. The traffic laws in Spain prohibit the towing of a broken down vehicle by any private individual or vehicle and therefore the laws requires that any broken down vehicle needs to be recovered by means of a professional breakdown recovery firm. Even if your car does not start in the morning you have a full 24 hour, 365 days a year assistance service. Most vehicle and car insurance policies do include breakdown recovery and legal defence as standard and others have it as an option, particularly if you are trying to save money and you don't think you will ever need this option, or you have some other form of cover. Be aware that if you do need to contract a private breakdown and recovery firm it will be very expensive, and you are not likely to have the legal defence part of the contract which supports you in the event of an incident. All vehicles should be fitted and or include a minimum of two road traffic warning triangles and at least 5 reflective jackets. One for each occupant of the vehicle if your vehicle is registered as a 5 seater. Pull off the road if you can and put on your reflective jacket, even if it is in the daytime. On two way roads, place one triangle in front of the car and another one behind, at a minimum distance of 50m, whereby they are visible for at least 100m beforehand. On dual carriageways and motorways one triangle will suffice, positioned at least 50m before the obstacle. Notify the roadside assistance company and explain your situation in detail, helping them to locate you as soon as possible. You can also send your location to them by sending your location details over whatsapp from your mobile phone. If you do not have a phone there are special SOS boxes which contain phones for you to call the assistance services on motorways. The breakdown recovery service in Spain will then come to your assistance and either tow your vehicle to a designated repairer or take you and your vehicle to your home if it is within 120km of your breakdown location. If you are a long way from home when your vehicle breaks down, the vehicle will be taken to a suitable repairer and you can arrange a hotel to stay in whilst your vehicle is repaired, or opt to make your own way home. With our Liberty Seguros policies your breakdown recovery assistance service starts from Km 0, (home). Technical roadside support from the moment you step outside your door. Transportation or repatriation of insured individuals. Transportation of the insured to collect your vehicle. Dispatch of a professional driver. Obtaining and sending copies of keys. Health care transportation and repatriation of injured individuals. Travel expenses for a family member in the event of hospitalisation. Transportation or repatriation of the deceased. Search and transport of luggage and personal effects. Keep calm, take a deep breath and assess the situation. To avoid any further accidents, park to the side of the roadway, switch on your emergency hazard lights, put on your reflective jacket before leaving the vehicle and position the reflective triangle. Check to see if there is any risk from flammable liquids, falling debris etc. Disengage the damaged vehicle, apply your hand brake and assess the state of any injured victims by speaking to them. Notify the emergency services by mobile phone or from the SOS phones, indicating where the accident too place, look for mileage indicators or landmarks to help with your description . Notify them of the type of accident, the number of vehicles involved, the number of victims and their apparent state of injuries. If people have been injured, the priority is to ensure they receive adequate and timely medical attention, so call the police or medical emergency and ambulance service by calling 112 as they will take care of the requirements for the emergency services. Injured parties are not to be moved in any circumstances. (This is the view of the insurers, not my personal view) However if a vehicle were on fire and a person trapped and the likelihood of the emergency services arriving within time was not going to happen, I would use common sense and try and rescue that person. In the event that any of the individuals involved should perish, one should not attempt to remove or move the body or alter the position of the body until the proper authority has arrived. Do not give them food, water or medicine and certainly no alcohol. Do not remove them from the vehicle (unless it is on fire or they are about to be run over etc.) or alter their position inside the vehicle. If they are wearing a helmet - do not remove it. If haemorrhaging occurs, cover the wound and press firmly with a clean bandage or handkerchief. (Do not apply tourniquets unless limbs have been amputated). If they are not breathing, check that their tongue or foreign object is not blocking their air passage and perform artificial respiration, without moving them from the seat. If they are unconscious, not breathing and have no pulse, remove them from the car (keeping their head and spine straight) and breathe twice (mouth to mouth) for every 30 chest compressions. www.insuranceinspain.com may provide more detailed information on resuscitation at a later date here. When your repair will immobilise your vehicle for more than 24 hours, Liberty Seguros will give you a group C rental vehicle such as a Renault Megane or Opel Astra for a maximum of 7 days. For a replacement vehicle call 902 193 740 , 24 hours, 365 days a year. Legal assistance for administrative traffic, transit and road safety offences. With this cover the following services are available. The formalisation of documents in opposition, defence depositions and appeals to higher courts. Telephone assistance if you lose your licence or are given points on your licence. The territorial scope of this coverage is limited to Spanish territories. Legal defence Servicies telephone number:- 900 123 077 from 9 am to 9 pm. The insurer, Liberty Seguros will replace your windscreen or car windows if they are broken or damaged. Call 900 102 314 if you require any glass replacements or repair due to damage.